REUTERS – France and Australia threw out Syrian diplomats from their capitals on Tuesday and other countries were due to follow suit as revulsion over the killing of more than 100 civilians in a Syrian town spurred them to act against President Bashar al-Assad. French Foreign Minister Laurent Fabius called Assad a murderer and Australia’s Bob Carr said those responsible for the massacre at Houla would be held to account. “Bashar al-Assad is the murderer of his people. He must relinquish power. The sooner the better,” Fabius said in an interview with French daily Le Monde. French President Francois Hollande told reporters Syria’s ambassador in Paris was being expelled. 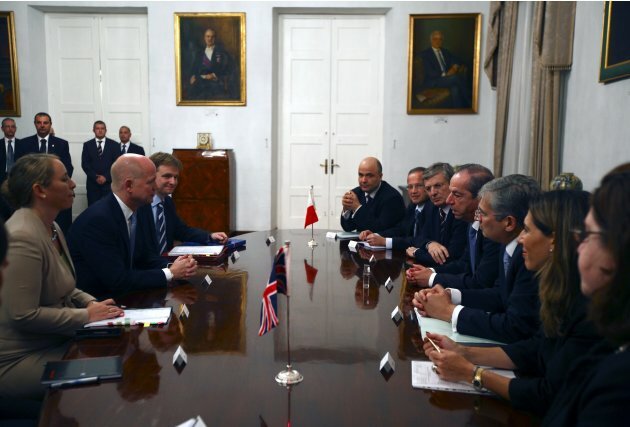 He said the decision was not unilateral but taken in consultation with France’s partners. Diplomatic sources in several countries told Reuters other governments would take similar action — a development which would mark a new phase in the international effort to halt the repression of a 14-month-old uprising against Assad and force him to relinquish power. The immediate catalyst for the expulsions appeared to be the massacre on Friday, including women and children, in Houla, although the international community is increasingly frustrated at the failure of a U.N.-brokered peace plan to end the bloodshed in Syria. Syrian officials denied any army role in the massacre, one of the worst since the uprising against Assad. Australia announced the expulsion of two Syrian diplomats including the chief of mission, Jawdat Alai, on Tuesday and gave them 72 hours to leave the country. “The Syrian charge has again been advised to convey a clear message to Damascus that Australians are appalled by this massacre and we will pursue a unified international response to hold those responsible to account,” Foreign Minister Carr said. Turkish Prime Minister Tayyip Erdogan also condemned the killings and said there was a limit to the world’s patience. “To carry out this kind of murder…while the United Nations observer mission is carrying out its mission in Syria is torture, it is wretched,” Erdogan said. “There is also a limit to patience, and I believe that, God willing, there is also a limit to the patience in the U.N. Security Council,” Erdogan told a meeting of his ruling AK Party. BEIRUT (Reuters) – At least 31 Syrian civilians and soldiers were killed on Sunday in bloodshed that coincided with a vote on a new constitution that could keep President Bashar al-Assad in power until 2028. 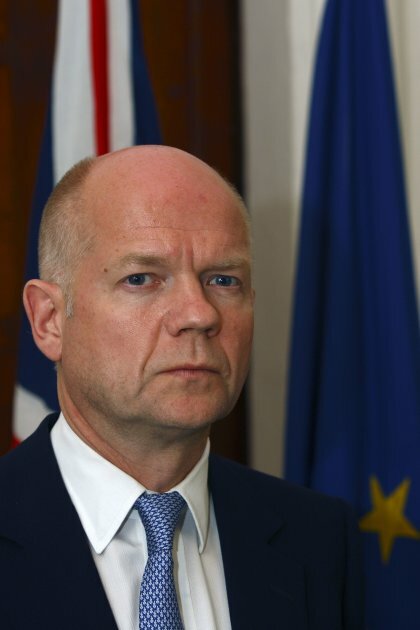 The British-based Observatory said eight civilians and 10 members of the security forces were killed in violence elsewhere in Syria, scene of what has become an increasingly militarised revolt against four decades of Assad family rule. 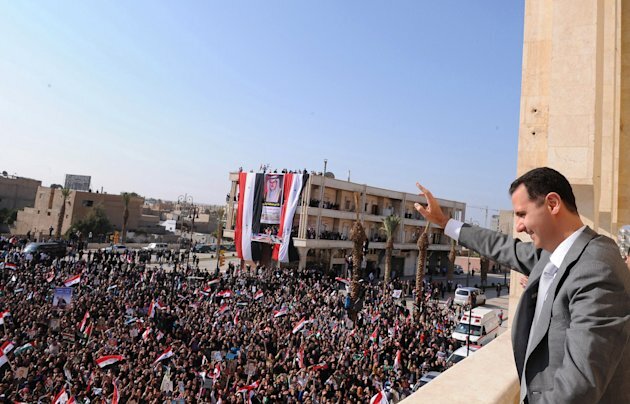 Voting was under way in the referendum on a constitution which Assad says will lead to a multi-party parliamentary election in three months, but which his opponents see as a sick joke given the unrest convulsing the country. He said people in opposition areas of Homs had wanted to burn copies of the new constitution in protest at the referendum, but it was too dangerous to venture out of doors. On Saturday security forces killed at least 100 people across Syria, including six women and 10 children, the opposition Syrian Network for Human Rights said. American correspondent Marie Colvin and French photographer Remi Ochlik were killed in the bombardment of Homs last week and two other Western journalists were wounded. The group is still trapped there despite Red Cross efforts to extract them. The International Committee of the Red Cross (ICRC) said it was still unable to evacuate distressed civilians from Baba Amro . After a day of talks with Syrian authorities and opposition fighters, it said there were “no concrete results”. “We continue our negotiations, hoping that tomorrow (Sunday) we will be able to enter Baba Amro to carry out our life-saving operations,” spokesman Hicham Hassan said in Geneva. Despite the violence in provincial cities across Syria, voting on the constitution went ahead in calmer areas. If approved, it would drop an article making Assad’s Baath party the leader of state and society, allow political pluralism and enact a presidential limit of two seven-year terms. 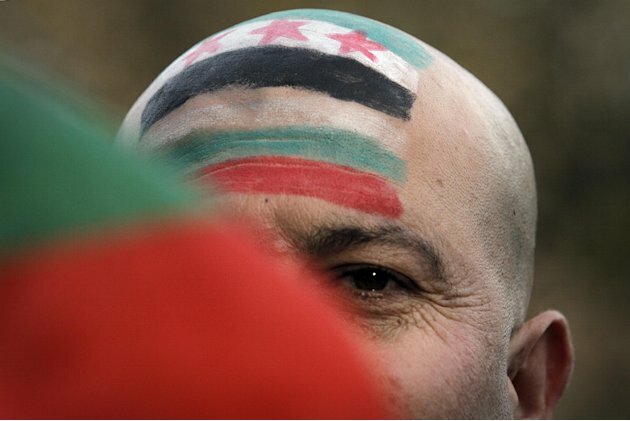 Anti-Assad activists have called for a boycott of a vote they see as meaningless. They said they would try to hold protests near polling stations in Damascus and suburbs where troops drove out insurgents last month. Some said security forces had stopped people venturing out to buy food in Homs on Saturday, confiscated their Interior Ministry-issued identification cards and informed them the cards could be retrieved at specified polling centres the next day. “They want to force people to vote in this doctored, so-called referendum,” activist Mohammad al-Homsi said from Homs. This is Syria’s third referendum since Assad inherited power from his late father. The first installed him as president in 2000 with an official 97.29 percent ‘yes’ vote. The second renewed his term seven years later with 97.62 percent in favour. GENEVA (AP) — Syria‘s nearly eight-month-old uprising has cost at least 3,500 civilian lives, the United Nations reported Tuesday, in a tally based on figures gathered outside the country. 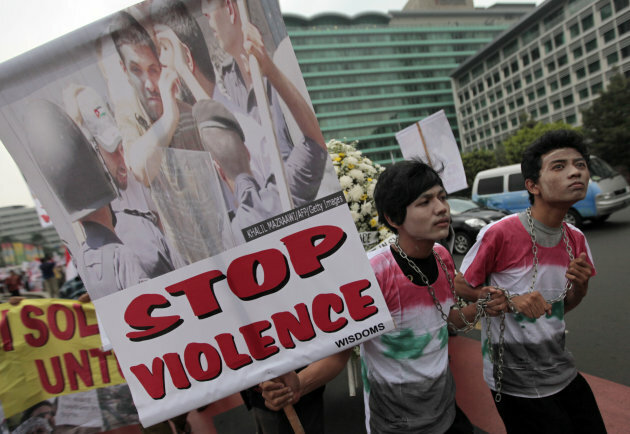 That includes dozens killed since last week’s Arab League-brokered peace plan, and the passing of a major Muslim holiday on Sunday, according to the U.N. human rights office. Ravina Shamdasani — a spokeswoman for the U.N. High Commissioner for Human Rights — said “more than 60 people are reported to have been killed by Syrian security forces since Syria signed the peace plan” sponsored by the league. She told reporters in Geneva the tally includes 19 killed on Sunday during the Muslim holiday of Eid al-Adha, also known as the Feast of Sacrifice. The U.N. figures are conservative and based on “credible sources on the ground,” though the agency itself has no one posted in the country, Shamdasani said. The government has largely sealed off the country from foreign journalists and prevented independent reporting, but amateur videos posted online and details gathered by activist groups have been filtering out. Damascus had agreed under the Arab League plan to pull tanks and armored vehicles out of cities, release political prisoners and allow journalists and rights groups into the country. As a result, she said, the U.N. human rights office is “deeply concerned” that the violence continues unabated as the government continues to use tanks and armored vehicles to attack some areas. Activists have reported that fresh attacks by Syrian troops on Tuesday morning killed two people in a rebellious neighborhood in the central Syrian city of Homs, as the military struggles to consolidate control over the district. A key opposition group, the Syrian National Council, declared the city a “disaster area” on Monday and appealed for international intervention to protect civilians, as well as calling for Arab and international observers to oversee the situation on the ground. Homs has a population of some 800,000 and is some 100 miles (160 kilometers) north of the capital, Damascus. Despite increasing international pressure, President Bashar Assad still has a firm grip on power and has shown no signs of moving to stop the crackdown on the uprising against his regime since mid-March. He blames the bloodshed on “armed gangs” and extremists acting out a foreign agenda to destabilize the regime, portraying himself as the lone force who can ward off the radicalism and sectarianism that have bedeviled neighbors in Iraq and Lebanon. Zeina Karam and Elizabeth A. Kennedy in Beirut and Maamoun Youssef in Cairo contributed to this report. 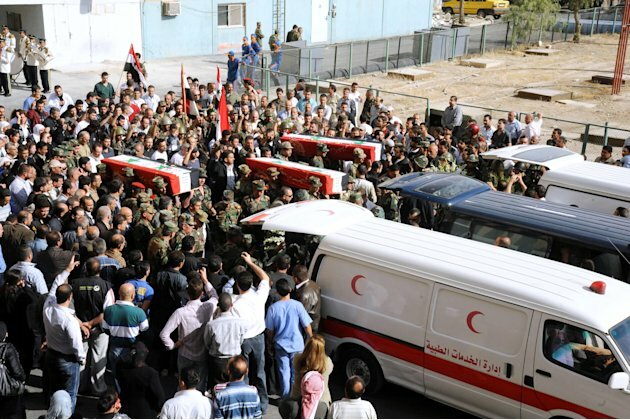 BEIRUT – Syrian tanks rolled toward a tense central city mourning the deaths of dozens of protesters, reaching the outskirts late Saturday hours after a funeral procession through streets lined with shuttered shops and uniformed security forces, witnesses said. 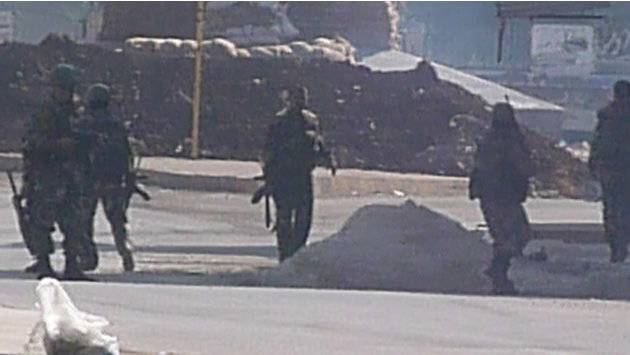 The government lifted its stranglehold on the Internet, which has been key to motivating people to join the 11-week uprising, but the crackdown that has left over 1,200 dead since March did not relent: Troops killed at least six protesters in the northern town of Jisr al-Shughour, according to the Local Coordination Committees, which helps organize and document the protests calling for an end to the regime of President Bashar Assad. Syria‘s state-run news agency, SANA, said “armed criminal groups” attacked several police stations in Jisr al-Shughour, killing two policeman. It said the attackers captured weapons from the stations. The Syrian government blames armed gangs and religious extremists for the violence. More than 70 protesters were killed across Syria on Friday, in what appeared to be among the largest demonstrations yet in the country. At least 65 of those were in Hama, the Syrian Observatory for Human Rights said. The tanks at the entrance to Hama caused new alarm. The city rose up against Assad’s father in 1982, only to be crushed by a three-week bombing campaign that killed thousands, memories of those days are still raw. 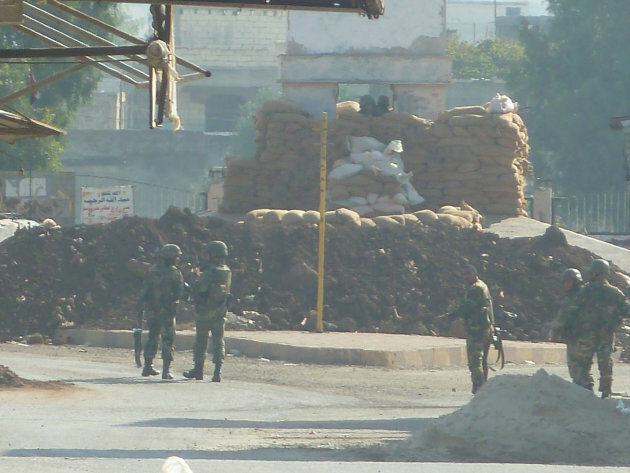 A Hama resident confirmed tanks reached the outskirts of the city. He said he had not yet seen them, but others had. “May God protect us,” the man said, his voice shaking. The Local Coordination Committees says at least 1,270 people have been killed and more than 10,000 arrested since the uprising began in March. The move toward Hama could mean that the army is preparing for a major operation there, similar to offensives in other areas in the past weeks such as the southern city of Daraa, the coastal city of Banias and the central town of Rastan where operations are still under way. After noon prayers — and before the arrival of the tanks — tens of thousands of people streamed out of mosques carrying coffins of the dead and headed toward the two main cemeteries, said Rami Abdul-Rahman, the rights group’s director. As they marched in the streets carrying the coffins, the protesters chanted “our souls, our blood we sacrifice to you martyr.” They later passed by hundreds of uniformed security members guarding a statue of the late President Hafez Assad, the father and predecessor of the current president, at the southern entrance of the city, witnesses said. Some of the dead where from nearby villages and were taken for burial in their hometowns, they said. The witnesses said that in addition to the tight security near the statue, hundreds of security agents guarded the local office of the ruling Baath party and the nearby police headquarters. But there was no overt friction between protesters and the troops. 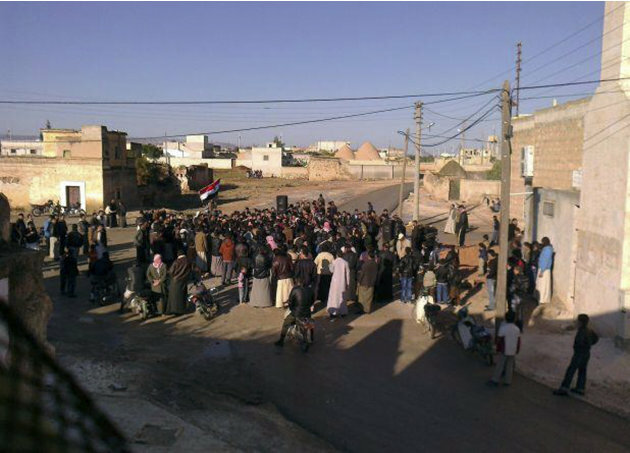 Residents said most shops in Hama were closed since the morning to protest the shootings. “People are in a state of shock,” a resident, who like many in Syria spoke on condition of anonymity for fear of government reprisal. The Syrian government has severely restricted the media and expelled foreign reporters, making it nearly impossible to independently verify what is happening there. 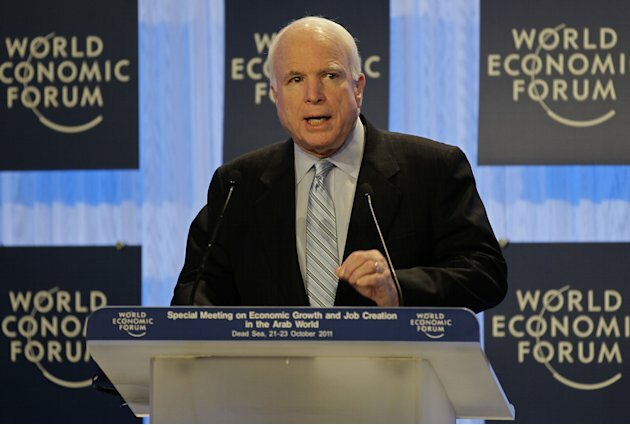 The Syrian Observatory for Human Rights also said authorities released a leading opposition figure Saturday. Ali Abdullah of the Damascus Declaration Group had been jailed since 2007 and was among hundreds of political prisoners freed this week after Assad issued a general amnesty. Assad also created a committee that he said would pave the way for a national dialogue, hoping the concessions would satisfy the revolt, which is posing the most serious challenge to the Assad family‘s 40-year rule. What began as a disparate movement demanding reforms has grown into a resilient uprising seeking Assad’s ouster. Assad has invited officials from 12 outlawed Kurdish parties to meet him, said Mohammed Moussa of the Kurdish Leftist Party, whose group was invited. He said the meeting is expected in the coming days. Such a move would have been unthinkable only a few months ago. Assad granted citizenship two months ago to stateless Kurds in eastern Syria — aimed at addressing protesters’ grievances. About 1.5 million of Syria’s 22 million people are Kurds. Syria’s Kurdish minority has long complained of discrimination. 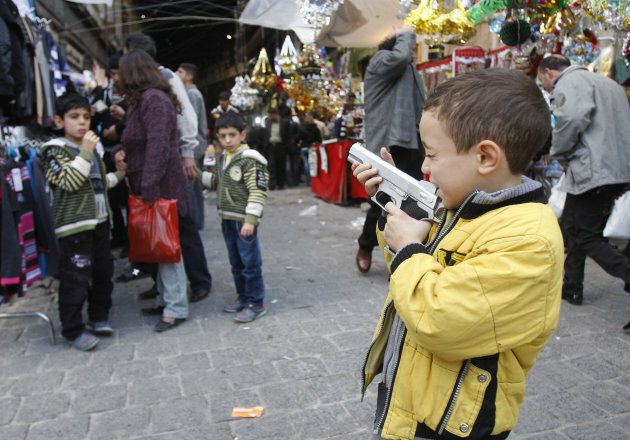 DAMASCUS, Syria – The Syrian government says 12 people were killed in violence rocking a seaside Mediterranean city. Syria’s state-run news agency said unknown armed elements on Saturday attacked neighborhoods in Latakia, shooting from rooftops and terrorizing people. Ten people, including security forces, residents as well as two members of the shadowy “armed elements” died in the violence. Some 200 others were wounded, most from the security forces, the report said Sunday. Syrian army units deployed in Latakia Saturday night following a day of violence and chaos in which protesters and the government traded accusations of violence and incitement. Cairo – Violence continued to plague Syria this weekend, as government forces killed more demonstrators in Latakia, protesters burned offices of the ruling party in the south and west, and mourners throughout the country buried the dozens of unarmed protesters killed a day earlier. President Bashar al-Assad of the ruling Baath Party began the day in what appeared to be a gesture intended to ease the crisis, when he announced the release of as many as 200 political prisoners. But by sunset, Baath Party offices were burning in at least two cities, the military was deployed in Latakia and once again government forces opened fire with live rounds, witnesses said. After more than a week of protests and human rights groups confirming that 61 people had been killed by government forces, there appeared to be no clear path forward for protesters, who had erupted in angry demonstrations around the country on Friday, or for the government, which has offered words of compromise at the same time that it has unleashed lethal force. Exact numbers of the dead are hard to determine, as the official government news service denied the authorities’ culpability in new reports blaming criminal gangs. By nightfall, government officials were blaming a sectarian clash for the crisis, which was quickly dismissed by protest supporters, who said the goal was freedom for all Syrians and an end to authoritarian rule. The day broke over a landscape of grief as mourners set out for funerals in the southern towns of Sanamayn and Dara’a, in Latakia, in the central city of Homs and in the suburbs of Damascus. In each place, demonstrators had been killed hours earlier, shot by government forces in the most violent government oppression since 1982, when the leadership killed at least 10,000 people in the northern city of Hama. But the mourning soon gave way to another surge of demonstrations, and then violence. At least two demonstrators in Latakia were killed after protesters set fire to the local headquarters of the Baath Party. Ammar Qurabi, the chairman of the National Association for Human Rights, said two witnesses reported seeing Syrian Special Forces open fire into a crowd. In the southern village of Tafas, near the protest movement’s epicenter in Dara’a, mourners also set fire to the local Baath headquarters. A government spokeswoman, Buthaina Shaaban, denied to BBC Arabic that government forces had opened fire on protesters, blaming instead foreigners and an armed group of villagers. “We arrested outsiders in Syria charged with opening fire on the crowd,” she said. “They stole weapons. 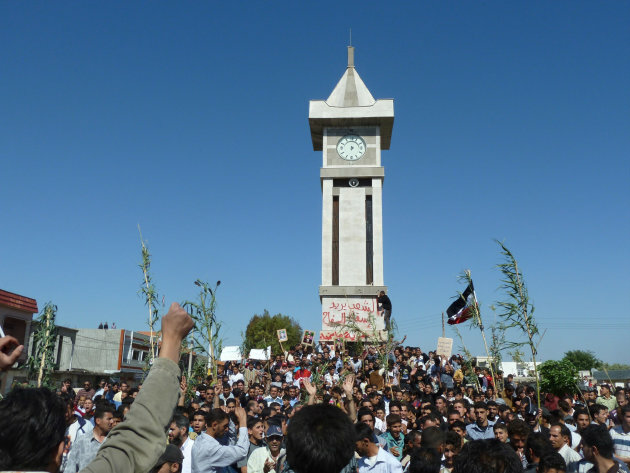 The authorities did not shoot protesters, but an armed group from Sanamayn” did. 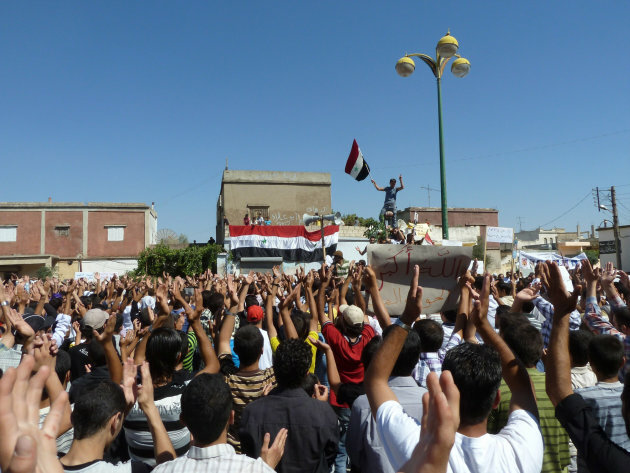 Protests have taken place around Syria since the start of the tumultuous movement for change that has shaken the Arab world with peaceful protest and conflicts approaching civil war. 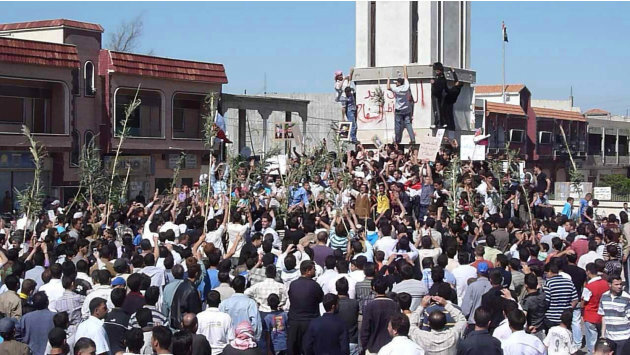 But the political crisis blew wide open about a week ago when demonstrators took to the streets in Dara’a after the police arrested a group of young people for scrawling antigovernment graffiti, hauling them away without notifying their parents. 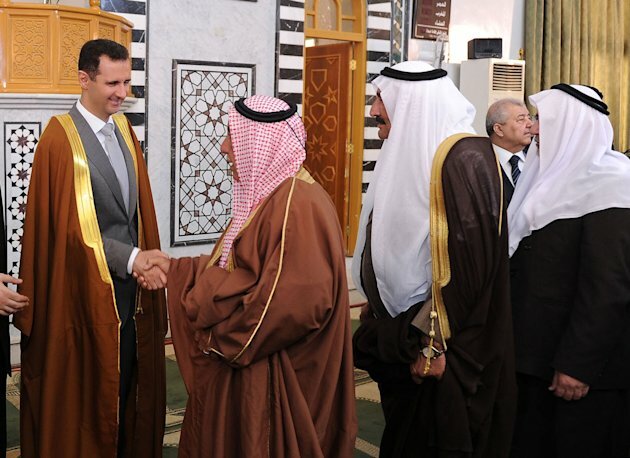 Syria is a resource-poor nation with great strategic influence in the region because of its alliances with Iran, Hamas and Hezbollah, and its location bordering Israel, Iraq, Turkey, Jordan and Lebanon. But it also struggles with a fragile sense of national unity amid sectarian tensions between its rulers, all members of the minority Alawite religious sect, and a Sunni majority. It also clings to a pan-Arab Baathist ideology. The Syrian crisis has in many ways followed a course similar to those in Tunisia and Egypt, which ended with the resignation of each country’s president. In Syria, there have been no widespread calls for President Assad’s departure, though as the anger mounts in the wake of protesters’ deaths, that view has started to gain voice. Mr. Qurabi, the chairman of the human rights group, said that more than two dozen protesters were killed Friday, including 20 in the tiny southern village of Sanamayn, 4 in Latakia, 3 in Homs and 3 in the greater Damascus area. Mr. Qurabi blamed live ammunition for all those deaths on Friday. This article “Tension and Grief in Syria After Protests and Deadly Reprisals” originally appeared at The New York Times.